Fuel Prices Have Started to Rise, So Why Are Airline Stocks Soaring? 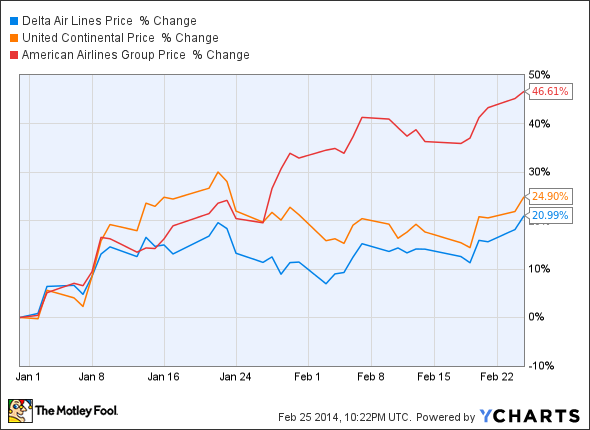 Airline stocks are flying higher in 2014 even though jet fuel prices have started creeping up again. This may not end well! For the past year and a half, it's seemed like nothing could hold airline stocks down. All of the major airline stocks posted monster gains in 2013, helped by a combination of margin expansion and improving sentiment. Two months into 2014, we've seen more of the same. Of the three big legacy carriers, shares of Delta Air Lines (NYSE:DAL) and United Continental (NASDAQ:UAL) are up more than 20% year to date. American Airlines (NASDAQ:AAL) stock has performed even better, rising nearly 50% in part because of a surprisingly strong projected Q1 operating margin of 6%-8%. Airline 2014 Stock Chart, data by YCharts. However, jet fuel prices have started to rise again. Much of the rapid profit growth seen at the major airlines last year was caused by falling fuel prices. If that trend reverses in 2014, the airlines will have difficulty replicating their 2013 margin growth. This makes some of the top airline stocks ripe for a significant pullback. Not coincidentally, the surge in airline stocks since late 2012 has come alongside a moderation in jet fuel prices. For most of 2013, Gulf Coast jet fuel prices were solidly lower year over year. Interestingly enough, the last time jet fuel prices were up more than $0.01 per gallon in consecutive months was October 2012. By contrast, jet fuel prices were down an average of more than $0.30 per gallon year over year from March to May of 2013. Lower jet fuel prices were a significant tailwind for airlines last year. Given that Delta, United, and American each consume about 4 billion gallons of jet fuel in a typical year, a relatively small change in jet fuel prices can have a big impact on the bottom line. Like Delta and American, United uses about 4 billion gallons of jet fuel a year. Source: United Airlines. In 2013, United's average jet fuel cost (including settled hedges) declined $0.15, from $3.27 to $3.12. This saved the company nearly $600 million, representing more than half of its $1.1 billion adjusted profit. United's fuel cost savings also exceeded its approximately $500 million year-over-year profit growth in 2013. Delta saw an even bigger drop in its jet fuel price, which declined $0.19 last year, from $3.26 to $3.07. This saved Delta more than $700 million compared to what it would have spent at 2012 jet fuel prices. This windfall accounted for roughly two-thirds of Delta's $1.1 billion jump in adjusted net income. By contrast, American's average fuel price (including US Airways) declined only $0.11 last year. That still saved the company nearly $500 million because of its slightly higher fuel consumption than Delta and United. This represented roughly 25% of the company's adjusted profit for the year, and one-third of its year-over-year profit growth. Falling fuel prices were not the only reason airline profits soared last year. This can be seen from the fact that Delta, and especially American, would have seen significant margin expansion even with constant fuel prices. However, the drop in fuel prices turned what would have been a good year for most airlines into a spectacular year for nearly all of them. Unit revenue gains at the three major carriers were in the 2%-3% range last year. Q1 2014 unit revenue has also tracked toward that level. Delta and American are both projecting a 2%-4% year-over-year increase, while United has projected a 0%-2% gain. That level of unit revenue growth will not produce much margin growth in a rising fuel-price environment. Airline bulls would probably argue that if jet fuel prices rise, airlines will boost ticket prices even further in order to continue growing their margins. This is true to some extent. However, the legacy carriers still face plenty of competition from smaller carriers like JetBlue Airways (NASDAQ:JBLU) and even No. 4 carrier Southwest Airlines (NYSE:LUV) in the U.S., and from other global airlines on international routes. If legacy carriers raise prices too much, smaller players like JetBlue will swoop in to gain market share. Source: JetBlue. Many of these other carriers are interested at least as much in growth as in maximizing profit margins in the near term. As a result, they may not go along with big fare hikes, preferring instead to gain market share with lower prices. In the first two months of 2014, airlines have continued benefiting from a fuel price tailwind. However, Gulf Coast jet fuel prices crashed nearly $0.70 per gallon last year between mid-February and the beginning of May, bottoming at $2.604 per gallon on May 1. Meanwhile, jet fuel prices have started to drift higher in recent weeks, moving from an average of $2.881 per gallon in the first week of February to $3.047 per gallon last week, before pulling back to $2.999 as of Monday. If the jet fuel spot price stays roughly constant -- and that's a big "if" considering the volatility of petroleum prices -- the airlines' fuel price tailwind will turn into a slight headwind next month. It will then build into a significant drag on earnings next quarter, as Gulf Coast jet fuel averaged about $2.77 per gallon in Q2 2013. Fuel prices can change on a dime, and it's possible that jet fuel prices will pull back soon and save airlines from a big price increase next quarter. That said, it's also possible fuel prices will rise further from today's level, putting even more pressure on the airlines' bottom lines. Changing jet fuel prices do not pose a long-term threat to airlines -- over time, airlines can adjust fares in order to ensure they remain profitable at any given jet fuel price. However, after a strong 2013, airline investors appear to expect substantial margin growth for the major airlines in 2014 as well. Unless jet fuel prices start to fall again, investors are likely to be disappointed on that note.